I have been an animal lover my entire life. I can remember pouring over the AKC Dog book for hours on end as a child (yes, I was THAT kid) and soaking up as much information as I could about all the various dog breeds. At one point my family members included 6 dogs (1 Border Terrier, 1 German Shepherd and 4 Basenjis), 5 horses, 1 cat, fish, mice, a rabbit, a lizard and a turtle, many of which were my companions. I learned to earn their trust and to care for them so that they lived long and healthy lives. I first became interested in professional dog grooming as a teenager but put those thoughts aside to earn a degree in business administration and pursue a career in Information Technology. I feel that I have come full circle now as I continue to build a business whose mission is to provide grooming services that not only make your pet look good but also helps to maintain their health and longevity. I am often asked how I got started with my business so here’s a little history. In 2007 I was immersed in training and showing my Chocolate Lab, Dixie, in rally, obedience and agility trials. One day, while bathing Dixie in the backyard in preparation for a show, the thought occurred to me that it would be much easier if I could simply go somewhere to wash my dog. Ideally, this place would have warm water, a choice of shampoos, conditioners, grooming tools, towels and dryers all on hand. No more cold baths with the hose in the summertime, my back hurting from bending over and the both of us standing in a huge puddle of water. No more hours spent cleaning the bathroom in the wintertime after my nice, clean Labrador managed to blow her coat from floor to ceiling. I did some research, partnered with a team of grooming business experts, and got started! In addition to my Chocolate Lab, Dixie, we have a Shepherd mix named Scooter that we rescued in 2001. He’s still frisky enough to race around the yard on cool mornings and gets 4 off the floor in his excitement over meal time. In 2013, a frightened little terrier mix unexpectedly joined our pack and promptly took over the household. 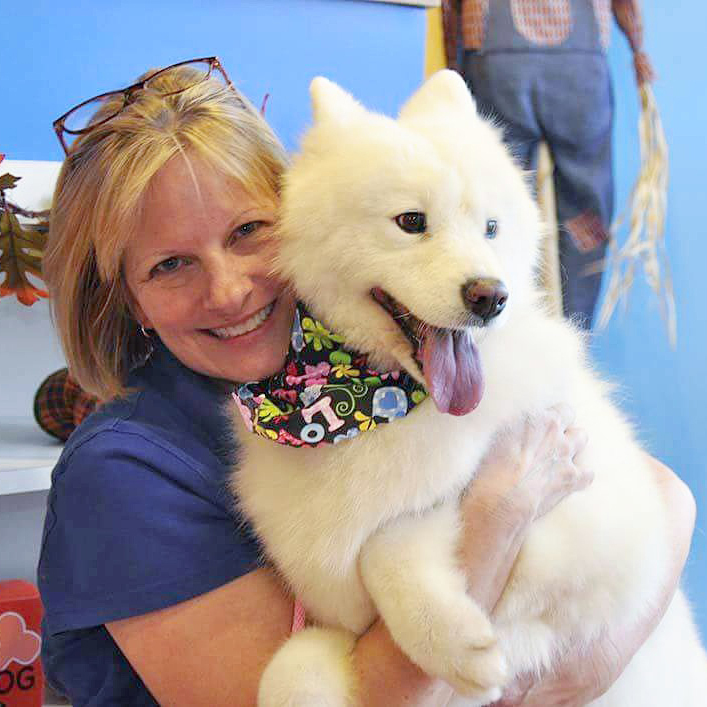 All of the dogs enjoy their walks around the neighborhood and, of course, their regular baths at Bark ‘N Bubbles.